Mom, the Intern: Blog swap. Last week, fellow blogger A Mormon Mommy (pictured above) asked if I'd like to swap blogs with her this week! I thought, Sure, why not? I figure, swapping clothes is fun ... and swapping spit is sure fun. Turns out, swapping blogs is fun, too! A Mormon Mommy is exactly that; a darling Latter-day Saint mother of three who enjoys writing about her life and faith. And get this; she was once a news intern, too! At a CBS affiliate, no less! What are the odds? Hope you enjoy her guest post! Be sure to check out my guest post on her site today! Hey all you Mom, the Intern readers! I am so excited to be blog swapping with Jenna! She’s a pretty fun gal and super talented writer! I, like Jenna, not only have a degree in Communications, but also interned at KUTV! Small world, right? 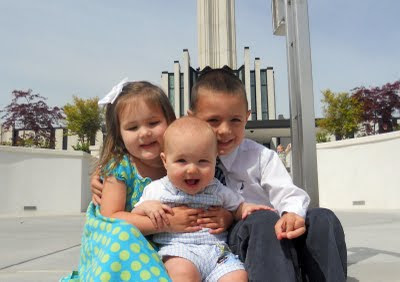 I blog over at A Mormon Mommy where I talk about anything and everything. I talk about my faith, how my religion shapes my life, I talk about my kids, how I met my husband, our trials and all the fun things in our life! I know for many of you school is just starting. It started for us a week and a half ago. I have a kindergartner for the first time and I love it. It helps that he really loves it, too! One day a few months ago, I was talking with a group of veteran school moms and I heard that most of them get up every morning and cook breakfast for their kids. At the time, it seemed crazy to me. Waking up even earlier to get breakfast on the table. But now that I am a kindergarten mom, I find myself doing the very same thing. Not sure if I don’t want to be shown up by the other moms, if I’m doing it out of guilt or if I just want my Buddy to have a good start to the day. But whatever my motivation, here I am doing it! So how do I keep from making the same thing or from just getting out the bowl of cereal? I have a list of things in my breakfast arsenal. We eat oatmeal. Not from a packet, too much sugar. I boil water, pour the oats in the bowl, add the water then sprinkle cinnamon and brown sugar on it. I even tried peanut butter…a-maz-ing! We eat pancakes. Quick and easy. You can add strawberries and whipped cream or just top with syrup. Or you can spread peanut butter on them with a little syrup! Again—a-maz-ing! Another favorite is from TrainerMomma. She has delicious recipes on her blog! We love her mini chocolate chip avocado muffins! Yes, I did say avocado muffins. Don’t knock it ‘til you try it! We do eggs at least once a week. We boil, fry, or scramble them. We add cheese or salsa for a different twist. Add a fruit to the side or a slice of whole wheat toast and you’re good to go! The when the weekend comes along, out comes the cold cereal and the milk! I may not be the world’s best mom, but by George my Buddy is going to get a good breakfast! After all, it is the most important meal of the day! What are some of the things you fix your kids before they head off to school? Give me some more ideas!! Can’t wait to see you over at A Mormon Mommy! On school days we eat either puffed kamut or puffed brown rice(Sprouts at 1.50 a box) with raw honey and raw goat's milk. And a banana. My kids LOVE LOVE it, they can't get enough. And I love that I'm starting their day with something healthy & alkaline. On Saturdays we eat some regular sugar cereal they get to pick out(so they don't feel too deprived) with raw goat's milk and Sundays we have eggs from our organic free range chickens and multigrain pancakes with real maple syrup. We mix up a batch of waffles at the beginning of the week and freeze them. They can go right into the toaster for a quick breakfast, just like eggo waffles! Except you make them yourself so you can use buckwheat or less sugar and stuff to make them healthier. We put nutella on them, or fruit and fresh cream, or sometiimes just plain syrup. We also keep some precooked turkey bacon around to go with...so good! Last year when my oldest was in 1st grade I decided that we needed to be doing better breakfasts! I think it's so important to start the day right. Oatmeal is a staple here. We don't do it much in the summer because I can't handle the extra heat in the house. One thing we like is to make breakfast burritos. If you get whole wheat tortillas it's very healthy. I always cook up some spinach in our scrambled eggs. The kids barely notice it and it adds lots of good nutrients. Will have to check you out! I also have a communications degree! Maybe we should form a club or something. I like badges. Thanks for all the comments and breakfast ideas! It's awesome to see that I'm not the only one who cares about breakfast for my kiddos! How ironic so many communications degrees! A club would be fun! My kids like to sleep in, so for us it is usually an easy quick breakfast. They like it best when I sit and talk with them while they are eating. So, I try to have my stuff ready so I can sit down with them for a few minutes and spend time with them before they start their day. I'm sure (soon enough)they won't want me to eat breakfast with them. So for us, it's likely cold cereal, but the company is what makes it special! She's a better mom than me. I cook a good breakfast on the weekend but not during the week... Hmmm maybe I should switch.